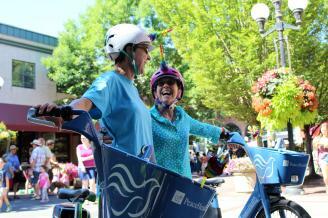 PeaceHealth Rides offers a healthy, convenient and fun way to explore Eugene. Pick up and drop off publicly available bikes for one-way trips across town. The bikes have GPS tracking systems and built-in safety features. Access hundreds of bikes at the bike share stations located throughout the downtown Eugene area, University of Oregon campus and the Whiteaker Neighborhood. Pay per trip or purchase a monthly package. Share bikes. Live healthy. Love Lane.